A new pop-up restaurant just opened, and it's a verrry good one. Location: Selfridges rooftop. I love rooftops in London because they provide the perfect escape from the busy London streets and of course they are perfect for tanning while eating/drinking. And oh my.. the food here is even better than the view! As true London foodies who want to see every new place that opens, Isabel and I went to Q last Monday. While we chatted over coffee & tea at the bar, waiters constantly passed by holding plates of amazing looking food. After seeing all this deliciousness we immediately decided to come back for lunch the next day. 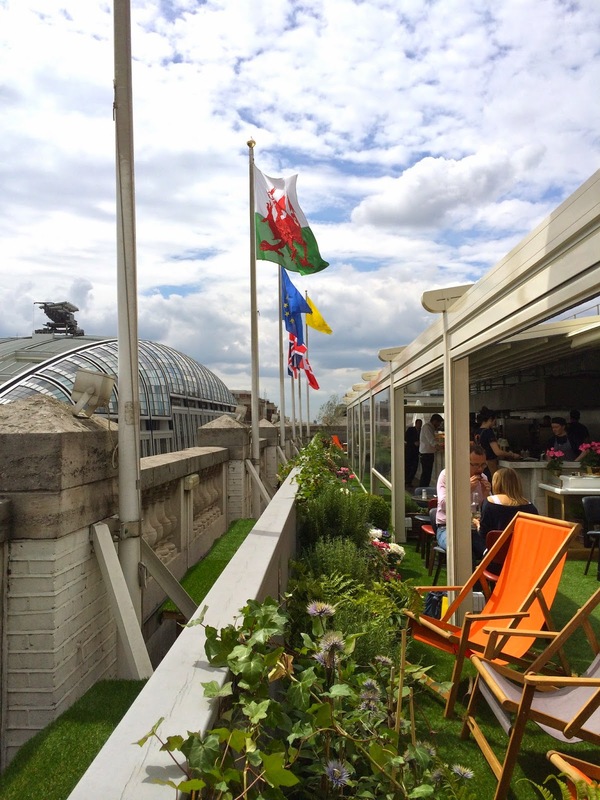 Though Q is just a temporary pop-up for the summer, there's a retractable roof in case it rains (which is often the case in London) - they thought of everything. When we arrived on Tuesday, the weather wasn't great but hey, if the food and company is good, nothing else matters right? The menu is quite small but that doesn't mean making a decision is easy. The ingredients are mostly locally sourced and seasonal: light fresh salads and grilled meats are the main focus. The menu is quite different to any other restaurant I've been to, I'd say there's something for everyone's taste. Isabel chose the Q smoked beets, kiln roast salmon & horseradish and I went for the chicken paillard, asparagus & salsa verde, some protein after my morning workout. Perfectly grilled tender chicken with a zingy salsa verde and fresh vegetables. Isabel's gorgeous looking dish also tasted the part! I love how the food is presented so beautifully and tastes as good as it looks. The priority of food should always be taste but if it pleases the eye then that makes the perfect meal for me. The side salad was simple: little gem lettuce, andives (not bitter! ), cucumber and a good dressing. Some sweets in case you're more of an afternoon-tea person. Can you spot the candy-striped straws? I love this fun little detail which makes you feel like you're in a park. Your drink just tastes better when it comes with a fun straw, or is it just me?